Campania, a region that lies along the Tyrrhenian Sea, has been much admired for its exquisite scenery, especially on its Amalfi Coast. Tourists are drawn to this pleasant Mediterranean land, just as the Ancient Greeks were; they settled here in 7th century BC and founded the city of Neapolis, now known as Naples. Other Grecian settlements have long faded, leaving only impressive ruins such as those found in Paestum, a well-preserved complex of ancient temples. Campania also has Roman ruins, none more famous than the cities of Pompeii and Herculaneum, buried in volcanic ash when Mount Vesuvius erupted in 79 AD. The volcano is still active to this day, but has never again caused such devastation. 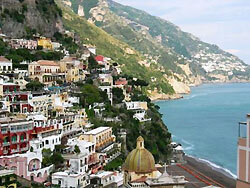 The Amalfi Coast area is one of the most desirable places to live in Italy. It is studded with pretty villages set into the mountains and overlooking the sea; their sun-drenched stucco villas speak of a life of leisure and solace. Just off the coast is the island of Capri, once the provincial domicile of the Roman emperor Tiberius. Today, Capri remains the domain of those with the budgets of emperors and princes. It is an island for high-luxury living; its high-class resorts and its streets lined with trendy boutiques offer a sharp contrast to the sleepy, traditional fishing villages that dot much of the Amalfi Coast. Another island, Ischia in the Bay of Naples, is considered even more beautiful than Capri, though it is not as well-known. Ischia is rich in geothermal springs and white sand beaches, although the finest of the beaches, Fumarole, is made of dark volcanic sands. The largest city in Southern Italy, Naples was founded by Greek settlers sometime in the 7th century BC. It was assimilated into the Roman Republic in 327 BC, but remained a city of Hellenistic culture. Over the centuries, Naples passed through various occupiers, including Byzantine dukes and the Normans, who left behind many Gothic-style landmarks, such as Naples Cathedral. In 1266, Charles I of Anjou made Naples the capital of the Kingdom of Sicily, and built the imposing royal residence of Castel Nuovo. Naples also briefly experienced French rule, and then, under the Spaniards, flourished into Europe's second largest city (after Paris) between the 16th and 18th century. Today, Naples is Italy's third-largest city. Naples is blessed with a richness of historic architecture: Roman villas, medieval castles, Baroque churches, Bourbon palaces, Neoclassical palazzi, etc. It has a classically elegant opera house, Teatro Di San Carlo, built in the 17th century for the Bourbon king Charles III of Naples. The city was a major centre for opera in the 19th century, and having a performance at the San Carlo theatre was once considered the pinnacle of an operatic composer's career. Naples is a city known for gastronomy; many iconic Italian foods, such as pizza, spaghetti, and gelato, were created or popularised in Naples. On the other hand, Naples is a chaotic place that has often been compared to Marseilles and even called the "Bombay" of Europe. The city is notorious for its terrible traffic. Furthermore, it is rather gritty in parts, with some neighborhoods exhibiting a great deal of urban decay. Perhaps the most attractive residential quarters within Naples are Posillipo and Vomero. Located by the Gulf of Naples, Posillipo is a lovely coastside district with an excellent view of Mt. Vesuvius. Vomero is an elegant quarter around the hill topped by the 14th-century Castle of Sant'Elmo. Recently, Naples experienced a serious garbage disposal problem that left waste strewn about the streets. In 2008, Italian Prime Minister Silvio Berlusconi tackled the issue and later declared it resolved; but while garbage was removed from the streets of central Naples, some of the outlying Comuni may still be dealing with waste disposal problems. Naples definitely has problems like any other big city; unfortunately, it tends to suffer from bad press more than it should. Naples is not without its charms. But those seeking to get away from big city life will probably not find what they are looking for in Naples.